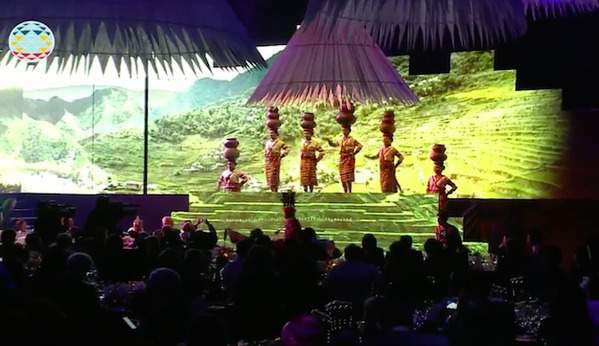 WATCH: Highlights of APEC 2015 Welcome Dinner Cultural Performance - Balita Boss! The economic leaders of the Asia-Pacific Economic Cooperation (APEC) gathered at the Mall of Asia Arena on Wednesday night for a welcome dinner hosted by the Philippines. APEC leaders were welcomed by President Benigno Aquino III and entertained in a cultural performances by the country's world-class performers Martin Nievera, Gary Valenciano, Jessica Sanchez, Charice, Journey frontman Arnel Pineda, Apl de Ap, and Jed Maddela together with internationally acclaimed groups like the Madrigal Singers, Douglas Nierras’ Powerdance, El Gamma Penumbra, Ramon Obusan Folkloric Group, and the Makiling Ensemble. Filipina pianist Cecile Licad also performed. Apl de Ap and The Voice Kids Season 2 finalist Reynan Dal-Anay sang "The Apl Song," and Black Eyed Peas' "Where is the Love." "Tonight, we Filipinos want to share something of our culture through our food, songs, and dance. And it is my hope that you see why so many have said that 'it is more fun in the Philippines'", President Benigno Aquino said in his opening remarks during the dinner. Below are the photos of the night’s performances shared by @apec2015ph, the Official Twitter account of APEC 2015 Philippines.